Profile and interview with the most dynamic Hong Kong filmmaker post-retrocession. The work of To Kei-fung is essential in the context of modern Hong Kong cinema. To begun his career, has many filmmakers and actors, in the ranks of the broadcaster TVB. In 1980 he directed his first feature film, «The Enigmatic Case», returning to the television to earn experience as a producer for six years. The commercial success started with «Eight Happiness» (1988), a comedy with Chow Yun-fat and Jackie Cheung Hok-yau, which became number one at the box-office, and the same would happen later with «All About Ah Long» (1989), with Chow and Silvia Chang and «Justice my Foot» (1992), with Stephen Chow Sing-chi and Anita Mui Yim-fong. 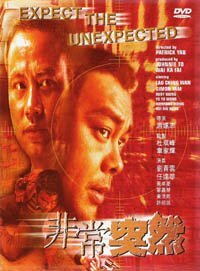 To's «Heroic Trio» and «Expect de Unexpected», a Milkyway production, signed Patrick Yau Tak-chi. 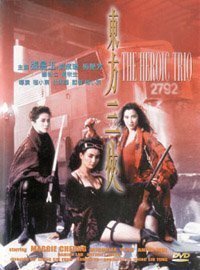 If «Heroic Trio» (1993) (co-directed with Ching Siu-tung) remains probably his more popular title in the West — due to a certain aesthetics not totally unrelated to manga, but also because it's almost a symbol of what one could expect from Hong Kong cinema at that time (comedy, action, emotion, the feeling that there are no limits and that everything is possible, for how shocking or silly it can be) — it was the creation of the production company Milkyway Image that made the name To more known to western critics and film festivals. 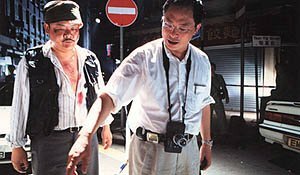 From 1996 on, To directed and produced a handful of noir crime films embedded by a strong sense of irony and conscience of genre conventions and clichés, which deconstructed the references of the triad film or the so-called “heroic bloodshed” sub-genre, which has a definitive symbol in John Woo. These titles include «Beyond Hypothermia» (1996), «The Odd one Dies» (1997), «The Longest Nite» (1998) or «A Hero Never Dies» (1998). This period was very well represented on a rare Exhibition of Hong Kong Cinema, in Lisbon, December 1999. As he mentions on the interview he gave us, from a certain point on, the production company had to travel in the direction of the market, trying to release more popular titles, especially comedies like «Needing You...» (2000), producing more bold and personal films at the same time. Cinedie Asia sent some questions to To Kei-fung, which was kind enough to spare some of his time to answer them. By Hugo Freire Gomes and Luis Canau. Cinedie Asia: During your career was there a specific moment in which you felt you were making more than simple entertainment or is there a film that you consider to mark such a transition? Johnnie To: In 1994, after completing «Mad Monk», I took a one-year break to figure out my next step. Having spent 10 years making commercial movies, I wanted to make films of my own. 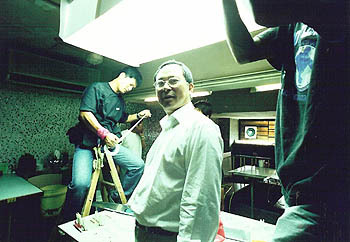 I took this direction starting with my next film «Loving You». .
To directing Lam Suet in «PTU» (2003). You have been collaborating with other filmmakers such as Ching Siu-tung and Wai Ka-fai. How hard it is to co-direct a film without each person's directions overlapping? And since you seem to have had a not totally happy experience directing a film for Tsui Hark, do you consider that the people that direct films produced by you have better luck, that is, do you try to leave your “mark” on the work or do you trust the director and let him accomplish his own vision? As a producer, I always encourage directors to pursue their own styles, and I try not to alter or take over their works. I have been a director for many years and I have a lot of respect for those of my profession. In «Heroic Trio» we sense amidst the action a comment about the unification of China . Does it make sense to imagine China, Hong Kong and Taiwan represented somehow on the three heroines? When you were making «Executioners», the sequel, did you decided from the start you be leaving no room for another sequel, even if the characters were popular with the audiences? I chose the 3 actresses  because at that time male actors were too expensive. It was also an experiment to see how the market will react to the all-female cast. Unfortunately «Heroic Trio» and «The Executioners» were not successful at the box office. I think the films have a much bigger following outside of Hong Kong. For a more complete and updated filmography see the Hong Kong Movie Database and the Internet Movie Database. In the mid-90's, the Hong Kong film industry decreased considerably its production and everyone talked about the end of a “Golden Period”. When Milkyway started to produce films such as «The Odd one Dies, «A Hero Never Dies» or «The Longest Night» some people considered we were facing another New Wave or the return of HK cinema to its good shape. How do you see the importance of your company amidst the current production status in the SAR and what do you feel about all the people that complain that HK cinema will never be the same as it was from the beginning of the 80's to the mid-90s? The industry went into a recession right about the same time Milkyway Image was created. It's a bit ironic, but it gave us the drive to work harder. The only way to improve the state of the industry is to make more and better films. At first we made a series of personal films, but later realized the market needs commercial movies to lure people back into the theatres. Today my partners and I are still working toward the same goal. You have been considered an “auteur”, at least in the West, very lately –considering you started your career in cinema in 1980 –, when other household names, such as John Woo, Tsui Hark or Ronnie Yu moved to (or passed by, in Tsui's case) Hollywood. Do you feel like a “late auteur”, or that you benefited in some way of the empty room left by the filmmakers that went abroad? My only goal is to make movies I like. Whether they're for the commercial market or for the film festivals. I know I still have a lot to learn and to improve upon. What I hope is new directors coming along and re-inject creativity into the industry so there's more to HK films than me, Tsui Hark or John Woo. I know some people, including critics, who passed from a moment of enthusiasm when they saw a handful of your films, such as «The Mission» or «Running out of Time», but then got sort of “confused” when watching comedies or other more popular or “commercial” films, since they are more used of analysing a director's work in the context of a filmography with common themes. How do you find the balance between Johnnie To the author and Johnnie To the director of straightforward commercial films? As I have said, Milkyway Image sets a clear direction in terms of what kind of films it wants to make. We separate our films into 2 catgeories: The commercial films and the personal films. As a film director, I have to be responsible to my investors and my audience. I hope critics can see films like «Needing You…» and their success as a proof that Hong Kong audience still very much support the local productions. While Hollywood has been trying to implement “HK style action” in many films (with disastrous results in most cases), the HK industry in a way also tried to make films more “like Hollywood”, with bigger budgets, CGI effects, and so on. How do you see the future of the local industry and do you think there's a risk of making films that are neither “like Hollywood” nor have the freshness, dynamism and originality which characterises Hong Kong productions? The future of Hong Kong films lies in the Mainland territory. The market there has traditionally supported HK films, and I'm sure we can expand the market there in the near future. Stylistically I think the importance is not whether if HK films will resemble or not resemble Hollywood films, but whether we as local filmmakers can create fresh ideas. HK films have been very inventive in the last 50 years, and I hope this trend will continue. Some people compared «PTU» to John Carpenter's «Assault on Precinct 13». What do you think of such a comparison? Getting back to the issue of not losing contact with current trends, and considering the big success of «Hero» could we possible expect to see a wuxia film directed by Johnnie To? What can we expect from Johnnie To for the near future? 2003 is going to be an important year for me and Milkyway Image, because we have decided to change our direction. This year audience will see new styles of films coming from us, and one of them may be a personal film akin to «PTU». Michele Yeoh Chu-keng, Maggie Cheung Man-yuk and Anita Mui Yim-fong. To actually though we meant a new Carpent film (the Chinese title probably hasn't much to do with the original). In any case, it's natural to assume that he hasn't seen the film.